Editor’s note: This post is an abridged version of the February 7th, 2017 Ottawa Historical Association talk “Relationships for Reconciliation: Historical Relationships in the Process of Reconciliation”. 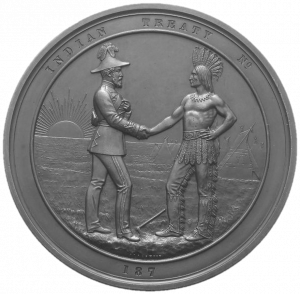 Treaty Medal, presented to commemorate Treaty Numbers 3, 4, 5, 6, 7. (Library and Archives Canada, Acc. No. 1986-79-1638). In December 2000, as a still new public servant, I was part of a group of representatives from Indigenous and Northern Affairs Canada (INAC) sent to discuss the historic relationship stemming from Treaty 6 with the Chiefs and councils of the Ermineskin and Louis Bull First Nations in the Maskwachis region, the heart of Treaty 6 Territory in Alberta. As the only historian and non-Indigenous person in the INAC group, I wanted to be well prepared. As the meeting approached, I began to review all the materials I had relating to the treaty, the communities and the government’s position on treaties. I was sure that I knew everything that was relevant and was ready to argue my “well researched facts”. Arriving at Louis Bull First Nation on a bitterly cold morning, we filed into the band council office where my departmental colleagues were greeted as old friends. When I walked through the door, someone called out: “Hey, look! The Indian agent has arrived!” to a round of chuckles. To say that I was shocked at the comment is an understatement. Immediately, my back was up as I resented being saddled with such that pejorative label. For me, the rest of it was downhill from there. Any comment I made about the history of the treaty by referring to historical research, archival records or the reports of the treaty commissioners was mocked with the words: “I guess the Indian agent knows us better than we do…” Finally, one of my colleagues took pity on me recommending that I simply stay quiet and that I skip the next day’s meeting. As a significant part of my work was to discuss the history of treaty making in Canada with Indigenous partners, this was not to be my only “difficult” experience during such meetings. Over the course of several years, it occurred multiple times. For the life of me, I couldn’t figure out why this kept happening and I felt growing anxiety about every upcoming meeting. I took me several more years to realize that I was part of the problem as these “difficult meetings” were being aggravated by my personal perspectives and my understandings of Indigenous-Crown relationships. During the early years of my career as a Public Historian, I failed to see that I was automatically in opposition to my Indigenous colleagues because of my confidence in my university education and my Western liberal views of progress. It would take several more encounters with other historians, colleagues, researchers, and especially treaty elders, for me to realize that, despite my belief that I was open to new perspectives, in reality I was completely limited by my own biases – biases that were constructed by my education, my upbringing in Ontario and my status as a white bilingual middle-class Canadian. Over the course of several encounters, I began to realize that my perspective was shifting. The words of elders, especially those working with the Office of the Treaty Commission of Saskatchewan and the Treaty Relations Commission of Manitoba, began to show me that there was far more to history than what was in the archives, that history is about the evolution of the relationships between people, and that there were several ways to look at the world. It took me over 15 years to see the history of these treaties in a different light and to accept that the history of the treaty is not the same as the history of the treaty relationship. I raise this for a simple reason: I am like many Canadians – raised and educated to believe in the value of Western progress, that Canada was built on strong moral grounds and that Canadian society has aimed to help those who are disadvantaged. Also like most Canadians, and until I started working at INAC, I’d had very limited contact with Indigenous history, culture or perspectives. This combination of so-called “Western worldview” and a general ignorance of the history of the relationships between Indigenous and non-Indigenous peoples has long been a contributing factor to the challenges faced by Indigenous communities in Canada. This limiting perspective persists today despite a real interest in the plight of Indigenous peoples in this country and the growing inclusion of Indigenous content in school curricula. The vast majority of Canadians are not yet ready to accept that their own perspectives are limiting engagement on Indigenous issues. The reason is simple: just like for me, it will take more than one report, one class, one newspaper article or one meeting with an Indigenous person to transform their perspectives and biases of Indigenous peoples. It will take time and effort to get average Canadians to come to think of these issues differently. From my admittedly limited perspective and experience, I have come to believe that if we are to find a way to address outstanding Indigenous issues in our country, we must recognize how our perspectives are hampering reconciliation efforts. One avenue for us to follow is reflected here at ActiveHistory.ca where numerous posts have sought to engage Indigenous and non-Indigenous peoples through an examination of history to reconcile our different perspectives of the relationships and move forward together. A closer examination and understanding of history can be an important lever for changing long held and problematic perspectives. In its final report, the Truth and Reconciliation Commission of Canada said that reconciliation is an ongoing process “about establishing and maintaining a mutually respectful relationship between Aboriginal and non-Aboriginal peoples in this Country”. The commissioners went on to say that to establish such a relationship, there must be an “awareness of the past, acknowledgement of the harm inflicted, atonement for the causes and action to change behaviour”. Through the work of the Commission and countless others, we have come to understand that reconciliation is a continuous process that aims to transform our current relationships into ones built on respect and mutual understanding. One of the central tenants of reconciliation is that we are trying to bring disparate perspectives and understanding together so as to create new ones based on shared ideas, values and goals. This can only be done through a better understanding of how these perspectives are impacted and influenced by history. A central element of all definitions of reconciliation is an awareness and acceptance of the past as a vital part of the process. As the Truth and Reconciliation Commission, stated “History plays an important role in reconciliation; to build for the future, Canadians must look to and learn from, the past”. The Commission points that Canadians are largely ignorant of the historical relationships between Indigenous peoples and the rest of Canada – an ignorance that hampers our efforts towards reconciliation. As I’ve learned through my experiences working alongside Indigenous partners, the history behind Indigenous issues is entirely grounded in the history of the relationships that have developed between individuals, communities and governments. And so long as we dismiss this history, we will have great difficulty in finding viable solutions. Part of the challenge that we as historians face is how we “tell” the story of these relationships, and we often ask ourselves whether we are working on the “right history”. As an Anishinaabe elder from Treaty 9 once told me, there is no “right” or “wrong” history – only incomplete history that will remain so until we put all the histories together. We need to tell the “complete history”, a history that makes us understand the mistakes of the past; a history that helps us understand the challenges we face right now; and a history that helps us plot out our future together. That, in my mind, is one of the roles of historians in reconciliation – to work at creating a more complete understanding of the relationships that exist between Indigenous and non-Indigenous peoples so that we can move forward together. I embrace this challenge because reconciliation in Canada cannot occur without an awareness and acceptance of our shared history. This is our history, the history of all those who live in Canada. Some may reject this shared narrative and others may be overwhelmed by the mistakes of our predecessors. By creating this shared narrative, we will have the tools required to build stronger and more respectful relationships between Indigenous and non-Indigenous Canadians. There are already examples of Indigenous and non-Indigenous peoples working together to create improved Indigenous-Crown relations. This is but the start of the reconciliation process and we have a role to play to help bring about societal change on a firm foundation of shared history. Jean-Pierre Morin is the departmental historian at Indigenous and Northern Affairs Canada and the Public Servant-in-Residence in the Department of History at Carleton University. Truth and Reconciliation Commission, Canada’s Residential Schools: Reconciliation, vol 6, p. 3. A very thoughtful and helpful reflection. Thank-you! Thank you, Jean-Pierre, for sharing your experiences and reflections on reconciliation. As a settler working in the heritage industry, I’m struggling to figure out my role in reconciliation when the discipline of History itself has its own legacy of colonialism. How can we decolonize the way we learn, understand and share history?